On Wednesday, 9/11, the Honolulu City Council will hear the first reading of councilmember Stanley Chang's Bill 59, another in a series of bills promulgated by the Council against the humblest in our community. My testimony follows. The illustration is from the referenced educational pamphlet published by the HSBA Auxiliary. Links to the pamphlet, as well as to Bill 59 and the agenda are at the end of this post. "Even in a democracy like Hawaiʻi has today, citizens must always be alert to the abuses of power. Voting does not guarantee good leaders." 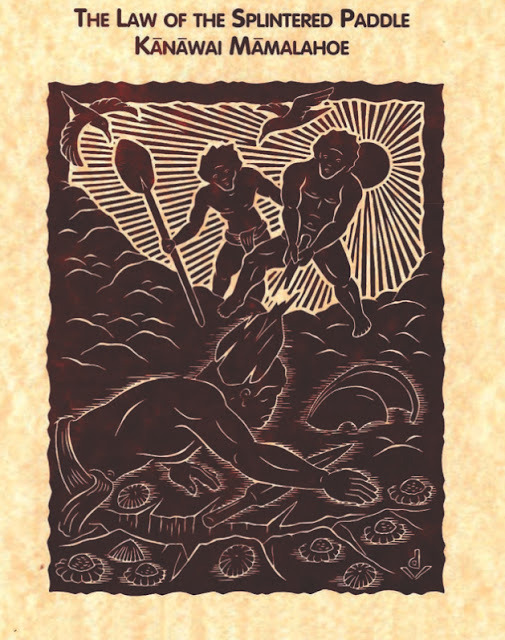 Although bills introduced in the past couple of years have outdone each other in criminalizing homelessness and outlawing free speech, Bill 59 is the first such bill to directly violate Kamehameha's Kānāwai Māmalahoe (Law of the Splintered Paddle). That law, important enough to be incorporated into Hawaiiʻs Constitution guarantees the right of our humblest citizens to, "A moe i ke ala, ʻaʻohe mea nana e hoʻipilikia," lie down by the road without fear of harm. Bill 59 criminalizes the homeless by prohibiting them to "lie down on a public sidewalk." Your laws have driven the homeless from the parks to the roadside where you now subject them to criminal penalties. At last week's Homeless Assistance Workgroup meeting organized by Senator Suzanne Chun Oakland, I learned that in addition to the homeless encamped on our sidewalks, there are 100,000 "hidden homeless," those who find ad hoc accommodation but have no place of their own. I also learned that Hawaii is 50,000 new housing units short of adequate housing for its people. Surely you must realize that Honolulu is the most expensive city for housing. The median price for a used single family home is $665,000. That's nine times the median household income. Financial experts advise families to spend no more than three times annual household income for housing. The solution to homelessness is obviously making housing more affordable. Yet you seem to advance monied interests and criminalize the homeless. I've heard the homeless dismissed as being mentally ill, but if that's the case, lack of housing affordability causes mental illness because homelessness increases as housing becomes less affordable. You seek to criminalize the poor when the fix to homelessness is affordable housing. In efforts to reduce homelessness, the public, our politicians, and our social service providers are often at cross-purposes. For politicians each tent on the sidewalk is a huge political protest sign that says, "Our politicians fail us! They are servants of the rich!" So the politician's main interest isn't in providing the "safe zones" and "housing first" of campaign promises. The politician's main goal is to get tents out of public sight. Social service providers are funded by the number of beds they can fill so more often than not they testify in favor of measures that force people into their shelters. But you have to question why people would rather spend the night out in the rain on the sidewalk than check into one of these "shelters." It sounds less like shelter and more like "jail." So for the homeless, it's one jail or the other. The public doesn't like seeing tents on the street either. They are uncomfortable reminders of financial insecurity and the failure of public policy and the politicians who make those policies. And that exactly what Bill 59 is: a very serious failure of public policy. "It was actually Kamehameha's way of saying, 'You have every right to defend yourself against aliʻi like myself and others who may abuse their power.ʻ"
And the ali'i who violated the law was in trouble. "Hewa no, make" -- break this law and die. Do not pass Bill 59. Abandon the parlors of the rich and help house the poor. Serve your people, and live. Instead of protesting everything and anything under the sun, how about focusing those efforts on protesting for affordable housing and things that lead to people being homeless? I feel that your guys protests are worthless and don't win any support from the public. Honestly, I've grown tired of seeing your group on my daily commute to work every morning. Have you seen the residents of the Kakaako camp? A lot of those people are chronic drug users, have sever mental disabilities or are pacific islanders. How do you find housing for people that don't want to live in shelters or follow the rules?